The DE Reflectors have been designed specifically for 1000W double-ended HPS lamps and ballasts to provide the maximum PAR value and uniform spread. 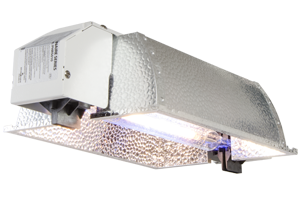 The compact size incorporates 95% European hammertone aluminum with a reflector engineered to deliver 94% efficiency allowing growers to significantly reduce the number of fixtures needed for growing success. Our reflector designs are initiated by grower feedback, and implemented by our team of engineers in conjunction with premier lighting design engineers. The result is the best combination of efficiency (highest amount of light) and uniformity (no hot spots) on the market. * Contact your PARsource representative for a list of compatible double-ended lamps.